Hooray! It’s the Fourth of July weekend, a perfect time to celebrate our patriotism by bringing our kids to see bursts of brilliant colour dance across the sky while we sweat profusely in public. To prepare you for your trip to take the kids to see fireworks, here’s a quick rundown of what to expect. Enjoy! 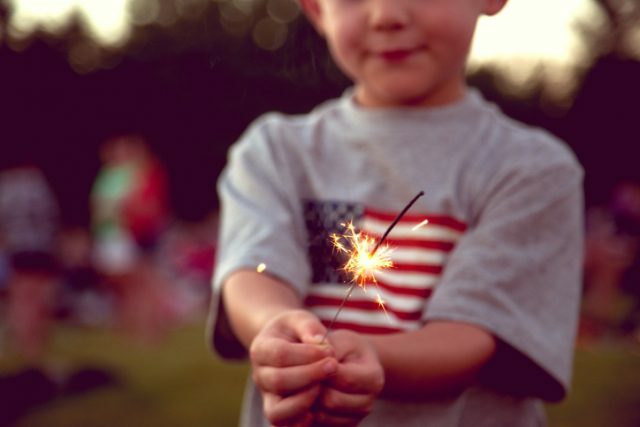 Now that you’re in the car, crawling out of your parking space for the epic journey back home, you gently suggest that the kids close their weary eyes while you put those blurry photos on Facebook, which only results in them loudly and fondly remembering each and every single firework that exploded. They’d like everyone to rank them by favourite (colour and sparkle being the most important factors in this decision, obviously). Rest assured, they will fall deep asleep as you roll into the driveway, earning you cardio points as you carry each of those sweaty, sticky bodies inside and up to bed knowing that you’ll be doing this all over again next year.